Push notifications are pop-up messages in a web application or on your mobile device. For machine builders, it is crucial to reduce downtime and maintain the highest levels of machine efficiency and effectiveness. 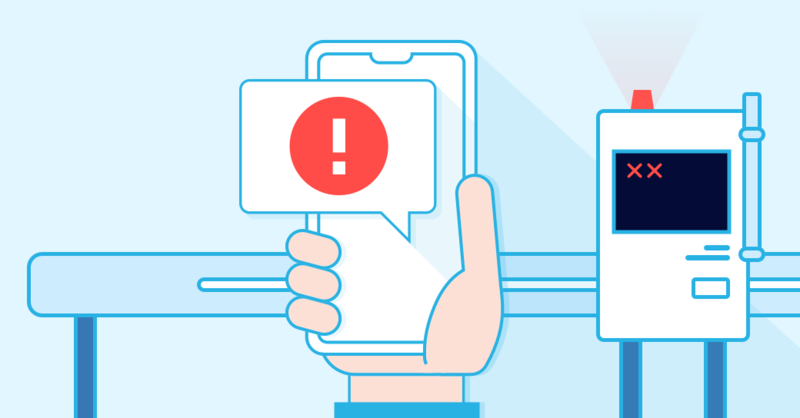 IXON now offers push messaging as a feature of Cloud Notify to send notifications for important machine events directly to your mobile devices. This will make recipients instantly aware of any machine issues and will allow for faster response times. Let’s take a look at how a packaging machine builder can use the Cloud Notify push notifications to improve their service response times. ProPack Machinery uses Cloud Notify to get notifications on important machine events, for instance, when the temperature of a liquid in a holding tank rises above 7°C. Messages were shown in the IXplatform message center and sent by email to service engineers. However, messages were only checked a few times a day, so the engineers wouldn’t be aware of any issues until they had actively checked their incoming messages. ProPack Machinery aimed to improve response times by enabling push notifications. Important machine notifications are now directly sent as pop-up messages to the mobile phones of service engineers. They can now react immediately after the issue occurred and response times have since greatly improved. Cloud Notify’s push messaging can help your business in achieving your goals. It is very easy to set up and does not require any programming. Simply set up a data source, add an alarm, and choose who will receive the messages and with which priority. You are even able to set up alarms for the IXrouter online/offline status. Has your curiosity been piqued? Try Cloud Notify now by claiming your free Cloud Notify license this December!